Victor Oladipo scores 23 points, Domantas Sabonis adds a double-double with 16 points and 12 rebounds as the Pacers defeat the Cavaliers, 111-102. October 8, 2010 - After a 111-102 win against the Cavaliers, Pacers head coach Nate McMillan, Victor Oladipo and Edmond Sumner spoke with the media. October 08, 2018: Domantas Sabonis finishes after the feed from Tyreke Evans. October 08, 2018: Tyreke Evans threw it the length of the court to an open TJ Leaf. October 08, 2018: Myles Turner gets to the rim for the strong finish. October 08, 2018: Myles Turner comes up with a big block. October 08, 2018: Victor Oladipo continues his nice first half with a pull-up jump shot. 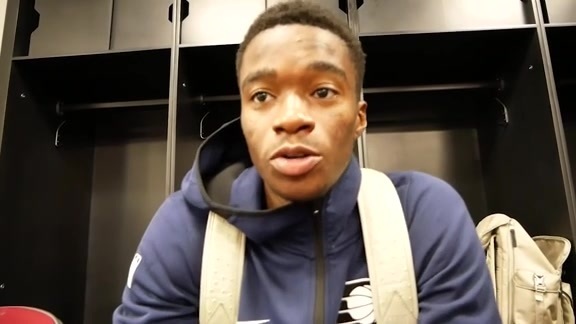 October 08, 2018: Edmond Sumner drives through the lane for a layup. October 08, 2018: Great ball movement finds a wide open Doug McDermott in the corner, who buries the 3-pointer. October 08, 2018: Domantas Sabonis shows off his range in the first quarter. 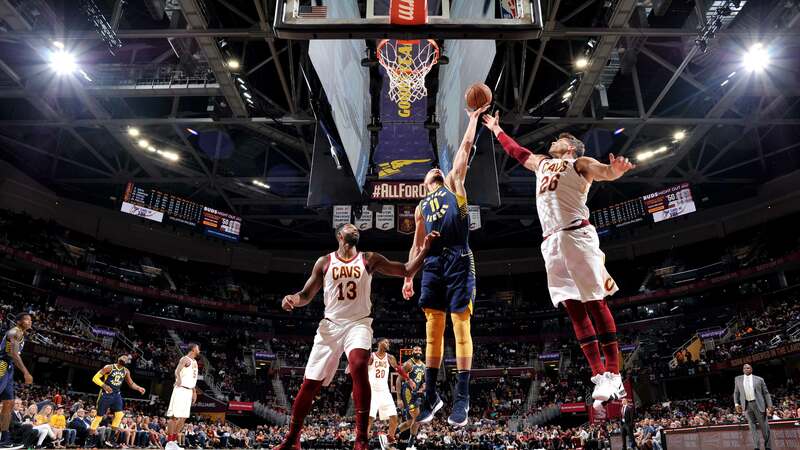 In their penultimate preseason tune-up, the Pacers picked up a win on Monday night in Cleveland, defeating the Cavaliers, 111-102. After Cleveland jumped out to an early 6-2 lead, the Pacers stormed ahead with a 19-4 run. All-Star guard Victor Oladipo led the charge, reeling off 10 points in that span, including a pair of 3-pointers. Indiana maintained a comfortable lead for the remainder of the first half and closed the second quarter with 10 unanswered points to make it 59-39 heading into halftime. Oladipo racked up 19 points in the half on 6-of-7 shooting. Two-way guard Edmond Sumner was the Robin to Oladipo's Batman, continuing his stellar preseason for the Blue & Gold. 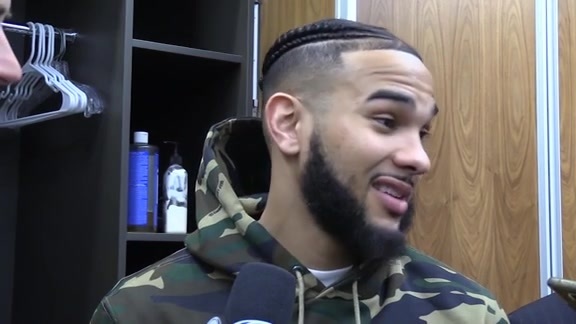 Sumner — in the rotation in place of Cory Joseph (left knee contusion) — hit all four of his shots while racking up 11 points in just nine first-half minutes. Indiana scored the first two buckets of the third quarter to push the margin to 24. Cleveland slowly clawed its way back into the contest from there, cutting the deficit to 85-77 on Bonzie Colson's layup with 9:37 remaining in the fourth quarter. But second-year Pacers forward TJ Leaf scored the next five points, getting a dunk and then a three, to put the game on ice. Oladipo led all scorers with 23 points to go along with six rebounds, three assists, and two steals. Domantas Sabonis picked up his third double-double in as many games, racking up 16 points and 12 boards in 22 minutes. Sumner added 14 points on 5-of-6 shooting and three assists, while Leaf tallied 13 points on 6-of-9 shooting. Veteran sharpshooter Kyle Korver led the Cavs with 17 points, going 4-for-7 from 3-point range. John Holland added 13 points and former Pacers guard George Hill stuffed the stat sheet, finishing with 10 points, seven rebounds, five assists, and three steals. The Pacers will close out their preseason schedule on Wednesday night in Chicago. Indiana will square off with Zach LaVine and the Bulls at 8:00 PM ET. 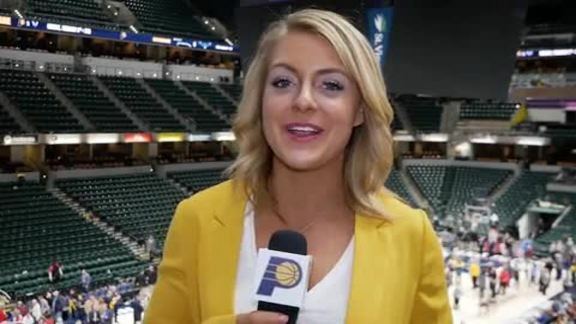 Sumner, who spent most of his rookie season rehabbing a torn ACL and appeared in just one NBA game and 14 G League contests, has been the breakout Pacers performer this preseason. He is averaging 11 points over three preseason contests and has made 13-of-18 shots. Sabonis is averaging 16 points and 12.7 rebounds in just 23.3 minutes per game this preseason. Pacers center Myles Turner made his presence known defensively on Monday, blocking three shots. After racking up 48 turnovers over their first two preseason games, the Pacers committed just 12 giveaways on Monday. Indiana outscored Cleveland 16-3 on the fastbreak. The Pacers dominated the Cavaliers on the interior all game, outscoring Cleveland 54-36 in points in the paint. Pacers starting forward Thaddeus Young missed his third straight preseason game with a bone bruise in his right foot. The Cavaliers held Kevin Love, Rodney Hood, Jordan Clarkson, and David Nwaba out of Monday's game. As always, the Pacers and Cavaliers will meet four times in the regular season: in Indianapolis on Dec. 18 and Feb. 9 and in Cleveland on Oct. 27 and Jan. 8. The Pacers travel to Chicago to take on the Bulls in their final preseason contest on Wednesday, Oct. 10 at 8:00 PM ET.